Home Pending Review You Are NOT like an Onion! 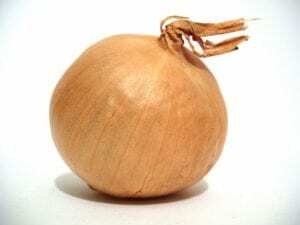 You Are NOT like an Onion! I am perplexed by the analogies of people and food: “people are like onions, in that they have a lot of layers” or “people are like parfaits, in that they have a lot of layers.” While I understand the theory behind these similes, I must heartedly protest. You, me, all of us, we’re not something to be dissected, peeled, shelled, shucked or skinned. The food/human comparison doesn’t work because food can’t be put back together. Once you take an onion apart, what you have is the makings of a good sauté but you no longer have an onion. If you take apart a parfait, all you have is pudding and frankly, I don’t want to be compared to tapioca. No my friends, we are not root vegetables or milk-based deserts. We are…wait for it…DIAMONDS. The formation of diamonds is a study of time and pressure. Time and pressure – doesn’t that sound like puberty through death? Raw diamonds are cut, faceted and polished and the whole process takes time, effort and skill. Generally speaking, the more facets a diamond has, the more valuable it becomes. The same can be said of people. The more facets or abilities, the more valuable we become. Our ability to be anything or everything we want to be is with us at all times. The different sides of us are not something we put on or take off but are merely a change in attitude or light or situation. You can’t see all facets of a diamond at one time. It is only in the act of turning the diamond, changing the perspective and viewing it in different lights that you can see how beautiful and rich it is. Actors are diamonds. Actors can show you different facets of themselves, or yourself, by painting the light with words, gestures and emotions. At the risk of gushing, every human being is a diamond. Some of us are just a little more sparkly and attention-demanding than others. Shocking, I know, but true. When we communicate and engage with each other, we up our “facet quotient.” By allowing ourselves to be more actor-like, we can find and use more and different parts of ourselves. Let’s face it, you don’t act the same way at a funeral than you would at a pool party or at home watching TV, but it’s all still you. Those behaviors prompt different facets of you to be used based on the needs of the situation. To be a better communicator, to be more actor-like, you need only to find that particular facet of yourself. Find it, sharpen and polish it. It’s the one that allows you stand unabashedly in front of people and bring the fire, ‘cause it’s already in there. Previous article“Green” Fashion… just a trend or is it sustainable?